August 16th brought us two more exciting MST3K episodes sold exclusively through Shout! Factory's website, as part of their Shout! Select line. Both featuring B movie veteran John Carradine, the films couldn't be more different (well except the fact they are both terrible). Red Zone Cuba is the first and the other is The Unearthly, which is the subject of this review. 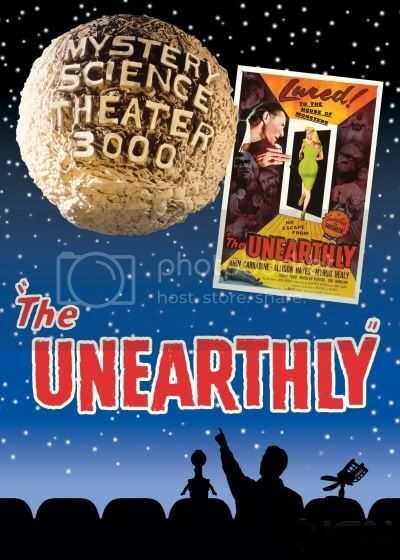 The Unearthly features Carradine as a mad scientist (that's a first) who thinks he has found the fountain of youth. Not literally, but he thinks he can stop the process of aging by implanting a gland into his subjects. The patients/victims he selects are to have no relatives or connections to the outside world, avoiding any problems should the experiments fail. As you would expect, things don't work out the way the mad scientist expected and his victims turn into horrific freaks. Two of the patients figure out what's going on and try to stop the doctor before he can use them as guinea pigs.